Hereford Cathedral School is among the oldest schools in the country. Although a song school may have been attached to the cathedral in Anglo-Saxon times, there is no evidence of the existence of a grammar school until a much later date. However, it is probable that such a school was established at Hereford Cathedral in the 12th century, possibly as early as the 1130s. Certainly Bishop Gilbert’s letter of 26th December 1384 appointing Richard of Cornwall as headmaster – a letter which has traditionally been regarded as marking the School’s foundation – implies that a grammar school had been in existence for some time, but that it had lapsed through the failure of the then cathedral Chancellor to appoint a Headmaster ‘to the prejudice of Holy Scripture and grave injury to the scholars who desire instruction’. Little is yet known about the School over the following centuries. Nevertheless, it is clear that during the Tudor and Stuart periods (1485-1714), it attracted generous patrons. It appears to have been rebuilt in the reign of Edward VI (1547-53); and it received considerable emoluments from Queen Elizabeth I in 1583. 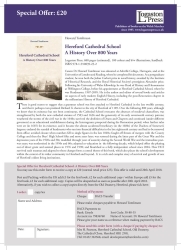 But its greatest benefactors came in the 17th century when Dean Langford, Roger Philpotts, a former Mayor of Hereford, and Sarah, dowager Duchess of Somerset, all gave sizeable bequests to the school for the foundation of scholarships. When Charles I granted new statutes to the Cathedral in 1637, the School’s endowment was also increased by the grant of a house and garden – on the site of the present School House and yard – in perpetuity for the Headmaster. The School building in use around this time was described by one local historian as having been ‘a beautiful piece of architecture of very high antiquity’, but it had fallen into such a state of decay that it was rebuilt in the mid-18th century. By 1762 a new schoolroom 80 feet long and 40 feet broad, with windows overlooking the palace yard, had been completed to the south-west of the Cathedral on the site of the old building. This was also used as a music room for the Three Choirs festival and for other public meetings. It lasted some seventy years. Thereafter, work had to be carried on in the Headmaster’s house until the School was allowed to use rooms in the College of the Vicars Choral. The modern history of the School may be said to begin with the building of class-rooms in 1875 on the site it now occupies, formerly the Canon’s Bakehouse, at the back of School House. The period from the late 19th to the early 21st century has seen a remarkable growth in pupil numbers – from under 100 boys to more than 800 boys and girls (from 3 to 18) and a corresponding increase in staff; an expansion in the number of sites from the one in School Yard to seven around the Close and in Castle Street; the adoption of co-education (in 1970); the integration of the Cathedral Preparatory School (now Hereford Cathedral Junior School, founded in 1898 and moved to its present site in 1925); and the development of purpose-built facilities (including most recently a new sports hall) and the School playing fields at Wyeside. Hereford Cathedral School may have moved from its original site but it has always been in close proximity to the Cathedral, that great building of Hereford which is its chapel. And although we teach and learn in modern surroundings, we work today with a consciousness that nearly a thousand years of English history looks down upon us. Floreat Schola Herefordensis!